I will admit to being slightly less trigger happy about buying some records immediately these days. It's getting tougher and tougher to justify sending big chunks of money on single 7"s. When this Baby Shakes 7" was announced, I could only find it from the label in Europe that co-released it. They did two different sleeves and I preferred the Japanese style one. Unfortunately to have it shipped to America it would have made this 7" something like $12. So, as much as it pained me, I had to pass and wait for it to pop up in an American distro. Unfortunately that never happened (that I saw anyway) and the first pressing went out of print. Luckily, when Baby Shakes put their new full length on sale they also made this 7" available through their webstore. Sure, it is the second pressing on yellow vinyl, but at least I was able to get the cool Japanese style sleeve. This is another fun Baby Shakes 7". The A-Side "She's A Star" is also on their new full length, but the B-side "Gimme Gimme Gimme Gimme Gimme Your Love" is exclusive to this 7". 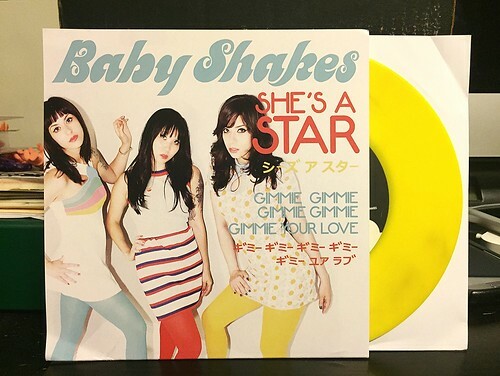 Baby Shakes play jangly, Rickenbacker fueled guitar pop that's equal parts 60's girl group and current day power pop supergroup. The vocal harmonies completely sell me on this band and I'm thrilled they're back with some new records. I have the new full length on tap as well, so look for a review of that sooner than later.